In Manoppello, a small town on the green hill at the foot of Maiella mountain, there is one of the most beautiful basilicas of the territory: the basilica of Volto Santo. Among the numerous relics that have been found during excavations of the XVII century, there is a veil successively named “Volto Santo” (Saint Face). The basilica, dedicated to Saint Michele Arcangelo, has been showing the veil for worship since 6th of April 1646. The “historical Account” kept in the provincial archives of the Capuchin of L’Aquila, narrates that the Volto Santo arrived to Manoppello brought by a mysterious pilgrim, then remained in Leonelli’s house until 1608, afterwards taken by force by Pancrazio Petrucci and sold to Giacom’Antonio De Fabritiis who gave it to the Capuchins who founded the basilica. Since 4 centuries the Volto Santo sanctuary has been destination of pilgrims coming from Italy and other parts of the world. Many people among scholars, theologians, philosophers, writers, artists, cultured men, clerical people and politicians stopped ahead of the Volto Santo. Like all the sanctuaries it is a place of “conversion, of reconciliation with God and an oasis of peace” (Pope Giovanni Paolo II) and “ clinical stop for the spirit” (Pope Paolo VI). But it is also a place rich of architectural elements of strong artistic importance. For more information of pilgrimages to the Sanctuary, you can address to the pilgrim office of the basilica. 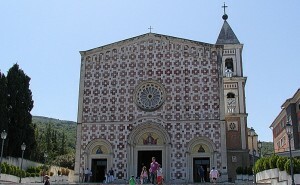 (source: official web site of the Basilica of Volto Santo).